Darwinian evolution has been falsified many times. With the recent bacterial find, it’s been falsified again. I have good reasons to believe all these things1, which makes my belief a rational one. (More on that here.) But the fact that regardless of what you show me, I will still believe them indicates that they are un-falsifiable statements, which make them statements of faith, not of science. – he expects us to continue to believe regardless of the nonsense and lies unbelievers present. On the other hand, science is not supposed to work that way. Karl Popper championed the idea of science as falsification, realizing that “… no amount of data can really prove a theory, but that even a single key data point can potentially disprove it.”3 There are limits to falsification4, but where falsification is possible, it is a valuable tool – a tool that helps identify and separate true science from faith statements. Because of that materialists scientists are increasingly turning away from the practice of falsification because when employed properly, it invalidates incorrect theories – including pet ones. This invalidation is a problem for scientists when theories, instead of being scientific, become philosophical outlooks (as in the case of evolution5) or when they lean toward the metaphysical (as in the case of multiverses6). This desire to protect scientific theories – even when it can be demonstrated they are wrong shows that science without falsification tends toward religion. In science disciplines where falsification is possible, it is easily demonstrable that scientists increasingly reject the notion of falsification because they prefer not to have their favored theories (like evolution) shown to be without merit by stubborn inconveniences like facts and evidences. In the case of metaphysical concepts like the multiverse – they prefer not to have their theories ruled as un-testable metaphysics or religion instead of science. Even this supporter of evolution can’t hide the fact that things don’t add up in the evolutionary worldview with this latest find. Their attempts to salvage the theory fall far short of believable. That attempt is this: evolutionists are saying this find actually proves evolution – because the environment didn’t change for the microorganism, and evolution predicts there should only be change when the environment changes – creating new pressures on the organism. Since mutations happen regardless of environmental factors – and they happen at “a regular rate” – so much so, that they can use mutations as a clock, how can it be that a micro-organism has not changed at all in 2 Billion years? Thus the incredulity of even the evolution supporting Schopf. When you consider it was only 5-7 million years ago that (evolutionists claim) chimps and humans had a common ancestor, it boggles the mind that this bacterium has not changed at all in 2 billion years. How many thousands of mutations were needed for the chimp-human divergence? And it happened (in theory) only 5-7 million years ago. And here we have a simple microorganism that has not changed in 2 billion (that’s billion with a “b”) years. Evolution is clearly not happening. Contrary to what Schopf states, this doesn’t need to be “explained,” rather it needs to be recognized that evolution simply did not, and does not occur, and thus you find microorganisms unchanged for billions12 of years. By their own standards evolution has been falsified, but few (if any) materialist scientists have the courage to step forward and admit it. The Cambrian explosion is a well documented problem for the theory of evolution. If evolution is true, the model predicts we’d find the simplest fossils at the lowest strata, starting with a singled celled creature. From this single celled creature, all other creatures should evolve, creating the familiar evolutionary tree, and leaving ever increasing complex fossils of the various creatures as you go up through the strata. This means by the time you get to very complex creatures, there should be a well established fossil trail of their evolutionary origins. On the other hand if creation were true you would expect to find complex creatures appearing all at once, without a fossil trail behind them. What does the fossil record show? 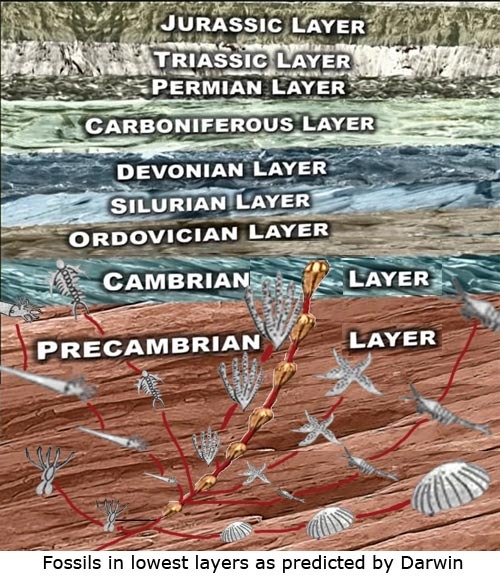 As the diagrams below depict, the fossil record shows complex creatures suddenly appearing in the Cambrian layer, with no fossil record of simpler creatures before (below) them. Above: Simplified depiction of the fossil record as it should appear if evolution were true. As you go down deeper in the levels, fossil remains should become simpler and simpler, going back to an original single celled creature called LUCA (Last Universal Common Ancestor). In the diagram, simpler, less evolved creatures are depicted by smaller creature icons. Above: Simplified depiction of the fossil record as it is actually found. Complex creatures suddenly appear in the Cambrian layer. 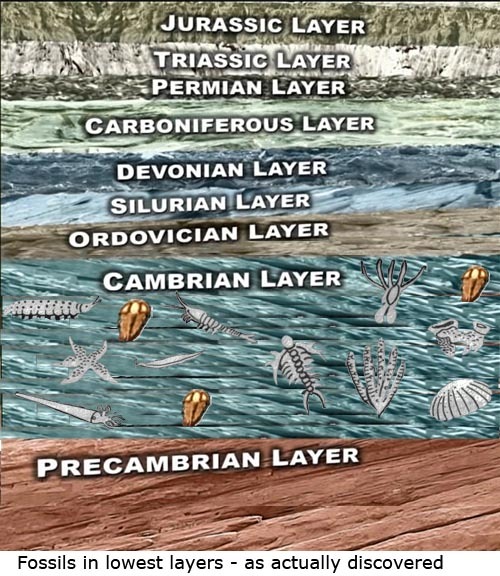 No simpler creatures found below them (before them in time) in the Precambrian layer. Neither Darwin nor any other evolutionist has a feasible answer as to why the fossil record does not contain what Darwin expected. Darwin attempted an answer by claiming the fossil record was incomplete – we hadn’t found enough fossils yet. After 150 years of looking, we still haven’t found the “rich fossiliferous deposits” of earlier periods that Darwin claimed should be there for his theory to be true. The conclusion is simple. His theory is not true. Further evidence coming out of the evidence from fossils found in the Cambrian layer is that of the body types or body plans which scientists call phyla. 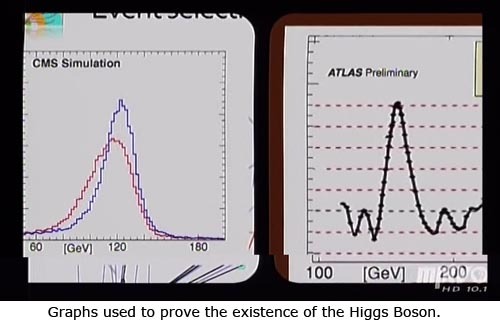 Before moving on to the actual evidence lets review the importance of graphical evidence using as an example the proof cited for the recently discovered Higgs Boson (also known as the “God” particle). The Higgs decays much too quickly for scientist to detect it directly so the scientists were looking for the signature of particles (photons) that the Higgs decays into. They measure those particles in units of gigaelectronvolts (GeV). The range for the particle they were looking for was between 115 – 127 GeV. unanimous evidence that the Higgs particle had finally been found. I point out these graphs to illustrate the importance of accurate, visually depicted data – which is what a graph presents. Scientists use such graphs to determine if their theories are correct or not. In the case of the Higgs, it shows Peter Higgs was correct in his theory of a mass producing particle. What about Darwin and his prediction of phyla as a result of evolution? As Meyer points out, the evidence is “radically at odds” with what Darwin’s theory predicts and requires. Put another way – the evidence of the phyla as graphed above from the Cambrian explosion falsifies Darwin’s theory. When you bring up such evidence, believers in evolution go into full damage control mode to convince you that the evidence above does not mean what it clearly means. (It clearly means that evolution as they depict it does not happen.) 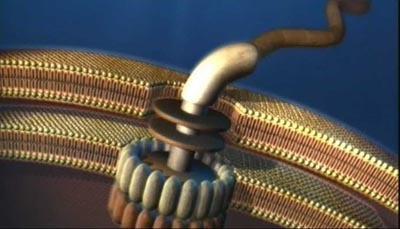 Just as they want to convince you that the above bacterial flagellum motor diagram, a representation of what Michael Behe calls an “irreducibly complex system” came about without design; (a ludicrous proposition) likewise they want to convince you that graphs of data that contradict evolution don’t mean anything. In their minds, the only graphs that mean anything are graphs that agree with their point of view. That is not science; that’s religious belief masquerading as science. Now don’t misunderstand me – they have a right to their beliefs. But if what they believe is impervious to evidence; if they refuse to change their beliefs regardless of what the evidence shows, that’s an indication what they believe is not science, it’s faith; it’s religion. It’s fine to have faith and religion, but they should identify it as such, and not masquerade it as science. If they don’t want creationists to present their beliefs as science (and they don’t – there are strong efforts to deny “Creation Science” is science16), neither should they masquerade their religious beliefs as science; particularly those beliefs that have been falsified multiple times by multiple lines of evidence. different physical characteristics, employed to avoid the conclusion that the universe we live in was obviously and carefully fine tuned for life. Multiverse allows the pretense that there are thousands of universes and one just happened to be setup correctly for life. 8 Lennox, John C. God and Stephen Hawking – Whose Design Is It Anyway? Oxford: Lion 2011, p 21. Lennox points out Hawking doesn’t seem to recognize he’s doing metaphysics. My point is scientists are in fact doing metaphysics in discussions of a multiverse – since the very concept of the multiverse is by nature a metaphysical one. Thus they either deny that they’ve moved on to metaphysics – or don’t recognize it – as Lennox points out about Hawking. purposeless, step by step process as required by Darwinian evolution. http://rationalfaith.com/category/young-earth/) the actual timeframe is thousands of years, not billions. This entry was posted in Cambrian Explosian - The, Complexity, Darwin, Evidence, Evolution, Evolution as Religion, Faith, Falsification, Fine Tuning, Fossils, God Particle, Intelligent Design, Irreducible Complexity, LUCA, Multiverse, Natural Selection, Neo-Darwinism, Science and tagged Jay Richards, JBS Haldane, John C. Lennox, Karl Popper, Mark Stoneking, Michael Behe, Peter Higgs, Stephen Meyer by Duane Caldwell. Bookmark the permalink.